For Janice Soulas, her Peirce journey began in 1987, when her employer encouraged her to go back to school for her associate’s degree in paralegal studies, and offered to pay for it. Janice followed her father’s advice, and enrolled in some initial courses at Peirce. Although she enjoyed what she was learning, life got in the way. 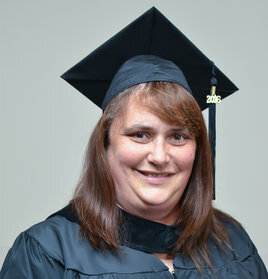 Some years went by, and when Janice returned to Pennsylvania to be closer to family, her employer again encouraged her to finish her degree. But, just as she was completing another course, life through her for another loop. Janice found out she was expecting, so she put school on hold once again to focus on raising her children. 11 years later, when Janice’s employer brought up finishing her degree, Janice was determined to complete what she started. “I’m starting to think my employers know something!” she laughs, reflecting on the encouragement she received. Now, five years later, and almost 30 years after she first stepped through Peirce College’s “arch of opportunity” at 1420 Pine Street, Janice is preparing to walk across the stage at Commencement 2016. As Janice reflects on this tremendous accomplishment, she is grateful to all the people who supported her along the way; especially her family, who always believed in her, all of the employers who encouraged her, and her professors and support team at Peirce College for helping her make it happen. If you began your studies at Peirce College, but life got in the way, that’s ok! We’re here to help you get back on track. Click here to take the first step. If your employer is encouraging you to earn your degree, you might be eligible for a 25% corporate partner tuition discount. Learn more here.